Peter S. Pascarella developed a desire to pursue a career in law from a young age. 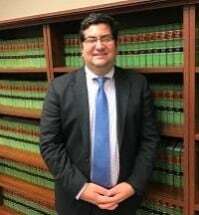 During his summers through high school and college, Peter worked for his father's law practice that handled real estate, land use, personal injury and criminal matters. After graduating from Rutgers- New Brunswick with a Bachelor's Degree, he decided to pursue his passion and attend law school. Throughout law school, Peter gained invaluable experience through several internships, perhaps none more influential than his time here at Fuggi Law, P.C., where he assisted the staff on personal injury, matrimonial and criminal cases. Peter graduated from Rutgers Law- Camden in May of 2017. After law school, Peter clerked for the Honorable Marlene Lynch Ford, A.J.S.C. (Ocean Vicinage) during the 2017-2018 term. While clerking for Judge Ford, he conducted research, wrote memos for the Judge providing a thorough legal analysis and assisted in drafting letter opinions and orders for matters before her Honor, which included Actions in Lieu of Prerogative Writs, Open Public Records Act appeals, and Eminent Domain cases. Peter is excited to join our firm and looks forward to providing our clients with exceptional representation in pursuit of their legal needs. The attorneys at the Fuggi Law Firm represent clients throughout the state of New Jersey, particularly in Ocean County, Atlantic County and Monmouth County.